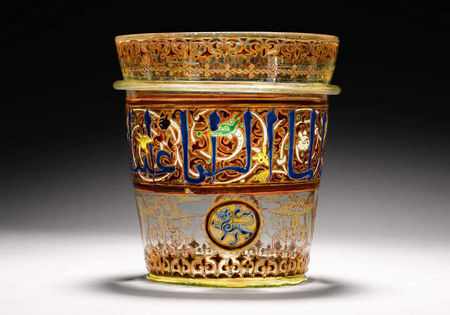 The highlight of the sale is A Highly Important Mamluk Gilded and Enamelled Glass Bucket or Finger-Bowl, one of the last Mamluk Glass Buckets remaining in private hands (Lot 96, Est. £600,000 – 800,000). 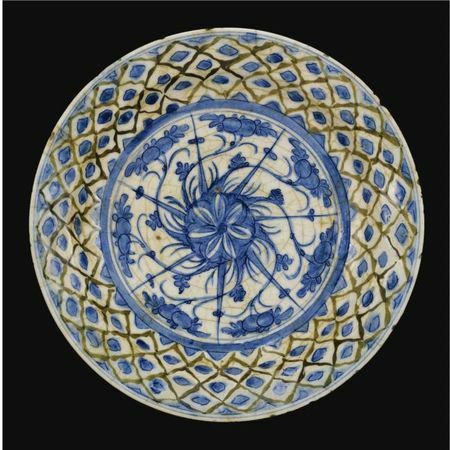 This superb piece of glassware dates from the mid-14th century and was made in either Syria or Egypt. The bucket is immediately striking for the vivid colouring that covers the surface which is enamelled with blue lettering, a winding white scroll, red leaves and various animal heads depicted in green, yellow and black on the top half, while the lower section features bright blue lions and double headed eagles outlined in red. The bucket was in the Rothschild Collection for over 100 years having been purchased by Baron Alphonse de Rothschild at a Paris auction in 1893. It is evocative of princely culture at a time when Muslim armies were evicting crusaders from across the Middle East. The Mamluk period dates marked the high point in glass production with the main centres of glass manufacture – Damascus and Aleppo – being sacked by Tamerlane shortly after the current piece was made. The bucket would have been passed around at the beginning or end of a meal for guests to rinse their fingers - the inscription appearing around the vessel reads “I am a toy for the fingers shaped as (in the form of) a vessel. 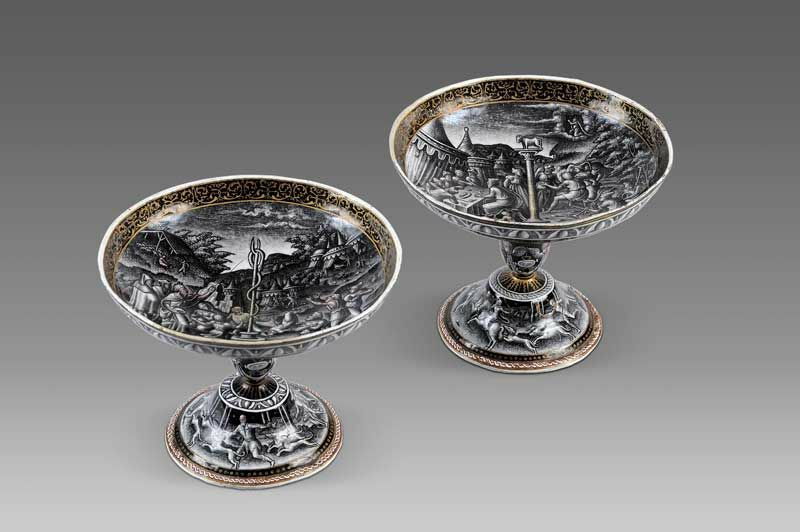 I contain cool water.” Four other buckets of this type are known to exist and three of them are in major museum collections in Cairo, Lisbon and Kassel in Germany. The whereabouts of the final bucket is unknown. 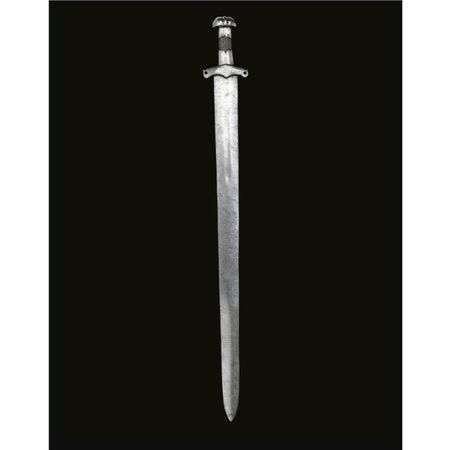 Another Mamluk piece in the sale is a fine steel sword made in the 13th – 15th century. It is typical of early swords from the Islamic period that were straight and double sided, very few of which have survived (lot 153, est £60,000 – 70,000). The early Muslim armies would have used straight swords such as this alongside slightly curved sabres that were more suitable for mounted warfare. It is thought that these straighter weapons were often reserved for use in investiture and enthronement ceremonies. A highlight of the Persian works in the sale is an Illustrated and illuminated Persian Manuscript with 25 Miniatures, Copied by Jamal al-din Husain Al-Shiraz dating from 1579 (lot 26, est. £80,000 – 100,000). The manuscript is beautifully illustrated with 25 particularly fine miniatures. 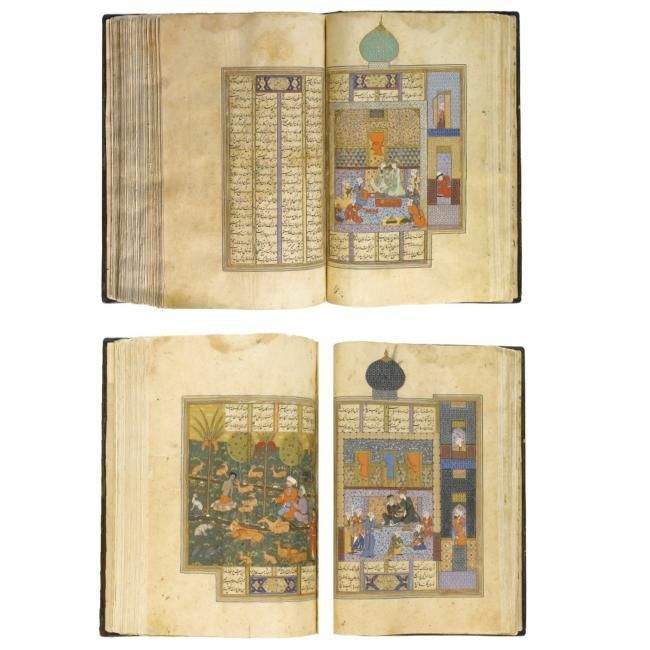 With the exception of two miniatures these illustrations are contemporary with the manuscript and serve as good examples of Shiraz painting at the end of the reign of Shah Tahmasp and the beginning of that of his son Shar Isma’il. 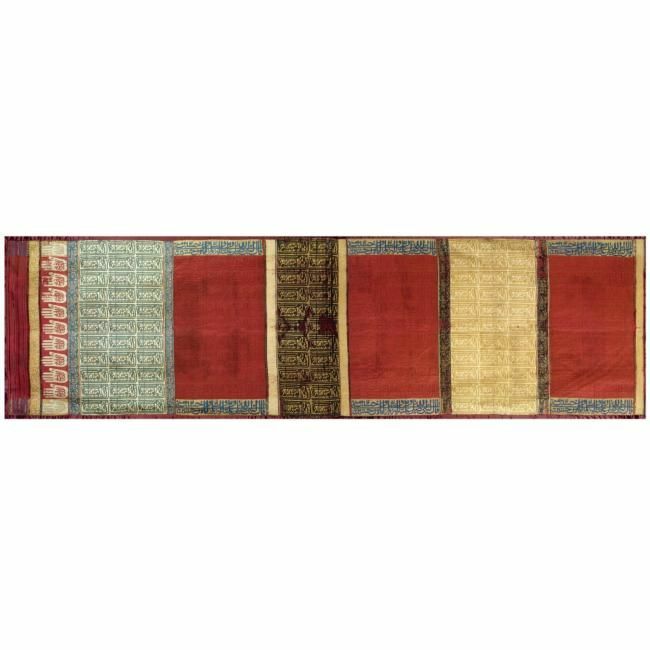 The manuscript contains the five poems of Nizami and tells the story of the Haft Paykar in which Bahram Gur, the Sasanian King falls in love with seven Princesses whose portraits he has recently discovered in his palace. When he becomes King of Persia he builds seven palaces with seven symbolically coloured domes for each of the princesses. The paintings show the King visiting each princess in turn on successive nights in a bedazzling exploration of the pleasure of romantic love. Another Persian highlight in the sale is a portrait by the Qajar artist Isma’il Jalayir from 1870 of ‘Ali, Hassan and Husayn attended by Angels, Animals and Holy Men (lot 36, est. £100,000 – 150,000). 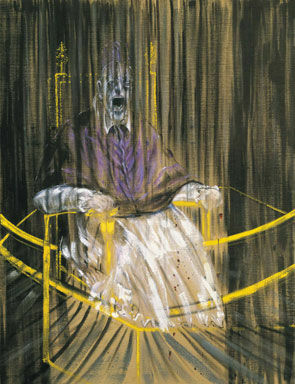 Works by this artist are extremely rare as he destroyed any paintings that did not meet his high standards. 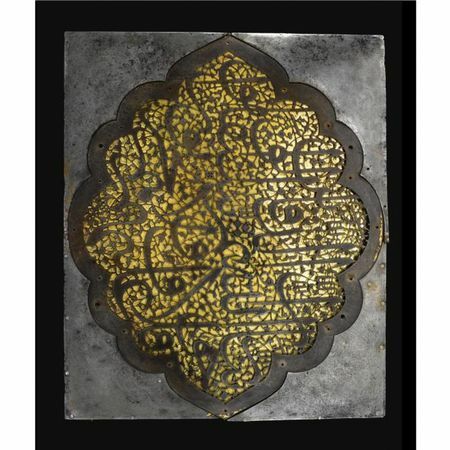 Only five major works by Isma’il Jalayir have ever appeared at auction and only a handful of museums have examples of this artist’s works in their collections - the majority of these are in the Middle East. The current work is painted entirely in black grey and white, producing an emotionless and almost dreamlike affect. 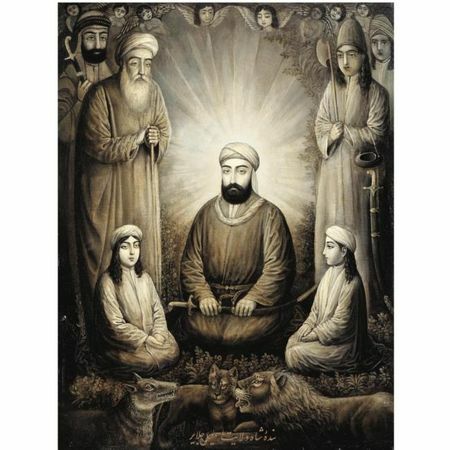 In the centre of the painting sits Imam ‘Ali emitting a bright light from a halo; he is surrounded by attendants, angels and animals that combine, with the monochrome technique to create an other-worldly, almost hallucinatory atmosphere. Other Safavid highlights include a pierced steel plaque with gilt mount from the second half of the 17th century, (Lot 111, est. £50,000 – 70,000) and a colourful Kubachi dish decorated in blue and ochre with a central flowerhead from the 17th century (lot 107, est. £8,000 – 12,000).